This light was designed for diffused and evenly spread light, with the perfect coloration and distribution while still being strong enough for Soft Coral and Large Polyp Stony Coral aquariums. A separate Nature Perfect blue channel makes for more realistic twilight & moonlight modes, enhancing the fluorewcence of your corals throughout the day! 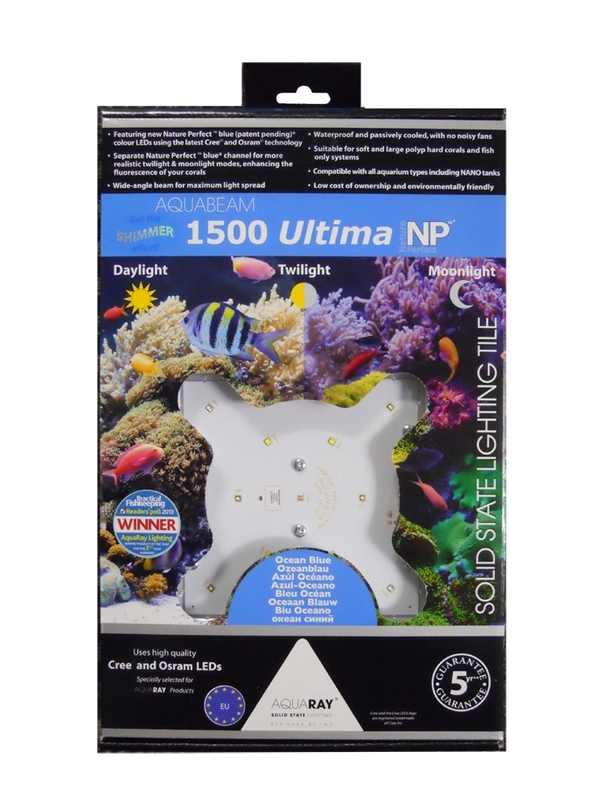 The 1500 Ultima NP is powered by 8 of the latest CREE XT-E PowerLED's running at Fiji Blue and 'Ocean White'. These are complemented by 4 Osram Olson NP blue LEDs. What is most impressive about these LED's is the improvement in their efficiency. These have the same revolutionary passively cooled design that is featured on the rest of the AquaBeam line, meaning hearing those cooling fans is a thing of the past. Copyright 2016 DrTim's Aquatics, LLC. All Rights Reserved.